Did you know that it takes 40 gallons of sap from a maple tree to make one gallon of pure maple syrup? This great tasting syrup is the reward for the hard work in the sugarhouse and sugar bush. Maple Rewards pure maple syrup can only be found in small shops; we do not wish to market through the large grocery store chains. We believe that this maple syrup is special and should be treated accordingly. How is Pure Maple Syrup Made? 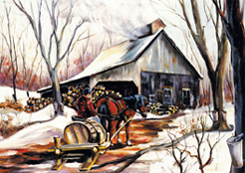 Pure maple syrup is made during a 4 to 5 week period in the spring. This is the time of year when maple trees are preparing for the summer growing season. The tree sap in the spring is much sweeter than the rest of the year to help the tree get ready for it’s summer foliage. 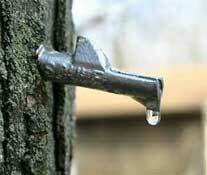 Sap can be harvested by tapping a small hole into the side of the tree. Strict guidelines are followed so that the tree is not harmed. Conditions must be right for the sap to flow and in general it only flows rigorously for about 10 to 15 days during this 4 to 5 week period. The sap is collected and then simply boiled until most of the water is removed and only sweet maple syrup is left. It takes about 40 gallons of maple sap to make one gallon of maple syrup. Nothing is ever added and only water is removed. Once the maple syrup is boiled and finished it is carefully filtered and stored until it is time to reheat it and package it into bottles. There are two general grades of pure maple syrup. Grade A and Grade B. Grade A is considered table grade syrup and is broken down into three categories: Light Amber, Medium Amber, and Dark Amber. Color is the key; the lighter the color the more delicate the flavor. 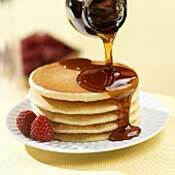 Dark Amber has a more definitive flavor and most people find it goes best on their pancakes. Grade B is one large category, which is used mainly as a commercial additive, or ingredient. Grade B has a very dark color and strong flavor, which makes it great for cooking and flavoring.